First of all I want to say thank you to all of my supporters out there. Along with fellow incumbents Pete Maass and Nick Pilch, I was sworn in on Monday, Dec. 5 for another four-year term. Now back to work. There are lots of policy issues to discuss, but first I want to talk about property taxes. The deadline for making the first installment payment was Dec. 10, and I’ve gotten questions about why property taxes for 2016-17 have risen about seven percent from last year. So here goes. I bought my house in 2000 for $461K. Since then its assessed value (not its market value) has risen to $587K, an average annual increase of of 1.52 percent. Under Prop. 13 the annual increase in assessed value is capped at two percent. During the past 16 years, my assessed value has risen by two percent in many years, but especially during the aftermath of the 2008 financial crisis, the annual increase was smaller than two percent, and in one year my assessed value actually declined. We have just made our first property tax payment for fiscal year 2016-17, which for California’s government agencies runs from July 1, 2016 to June 30, 2017. I estimate that next year, FY2017-18, for the first time, I will be pay more than $10K annually in property taxes for my little Albany bungalow. In other words, our property taxes rose about seven percent this year, and will probably rise almost that much next year. 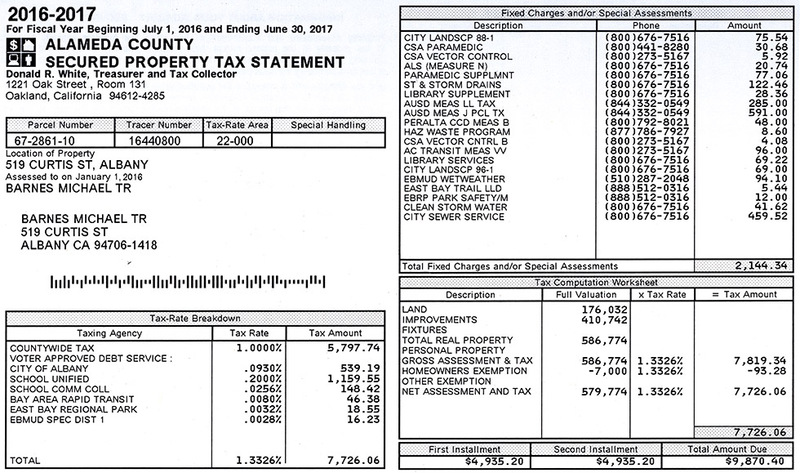 Below is a copy of my property tax statement, which shows my taxes divided into two categories, ad valorem taxes on the left, and fixed (parcel) taxes on the right (click to enlarge). Ad valorem is defined as “in proportion to value.” My assessed value is listed as $586,774 but I get homeowner exemption because I live in my own house, which knocks down my taxable assessed value to $579,774. That figure is the base for the ad valorem percentages on the left in my tax bill. The largest item is the one-percent rate that the county charges, which is capped at that level under Prop. 13. That’s $1,000 per $100K of assessed value. Next comes the City of Albany ($93 per $100K), the Albany Unified School District ($200 per $100K, but rising to $250 next fiscal year), community colleges ($25.60 per $100K), BART ($8.00 per $100K), East Bay Regional Park District ($3.20 per $100K) and East Bay Municipal Utility District ($2.80 per $100K). Those percentages sum to 1.3326 percent. For my taxable assessed value, that’s $7,726.06 ($1,332.60 per $100K). To the right on my property tax bill are the fixed or parcel taxes. These do not change based on your assessed value. They are a lump sum, although I’ve noticed that people living in the Pierce St. condos pay slightly less to the city. I don’t want to spend too much time on these fixed assessments because they are relatively small (they are the gray bars in the graph above), and they grew very little this year, less than $20. There are only four parcel tax line items that are more than $100. Two are AUSD parcel taxes, and two are city sewer and storm drain taxes. Together they sum to $1,457.98, which is 68 percent of the total parcel tax amount of $2,144.34. So as a percentage of the total, the two AUSD parcel taxes comprise 41 percent ($876), while the two big sewer and storm drain taxes comprise 27 percent ($581.98). 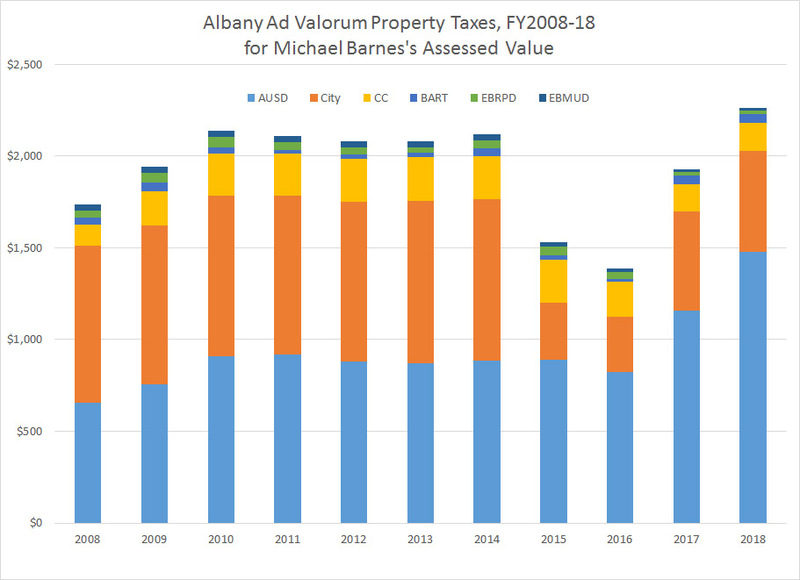 In the chart below, I show how the ad valorem tax rates have changed during the last 10 years (click to enlarge). These quantities are ad valorem taxes per $100K of assessed value. Note that to keep the chart horizontal, I’ve truncated the county’s portion. The bars start at $900, not zero. The county’s portion is always $1,000 per $100K of assessed value. The AUSD portion is orange is this chart. It remains fairly constant for several years, drops to $144 per $100K on FY2015-16, climbs to $200 per $100K this fiscal year, and will climb again to $250 per $100K next fiscal year. The City of Albany bars are gray. The city’s portion remained stable for many years, dropped very low in FY15 and FY16, and this year jumped back up, but not to the historical levels. This pattern is due to a CalPERS (California Public Employee’s Retirement System) pension payment holiday that lasted only for two years. The school district is fond of pointing out that even with the dramatic increases in AUSD ad valorem tax rates, the total rate is still below the historical peak of 2010. That is true only for two reasons–first the Measures B and E tax rates don’t fully kick in until next year, FY18, when they will raise the total to $250 per $100K assessed value. Next fiscal year the combined AUSD and City of Albany taxes rates will be at a historical high, but because the BART rate (yellow) has declined, the total tax rate for FY18 will be slightly lower than the historical peak in 2010. But this is misleading in another way. Between 2010 and today, our assessed values have risen. 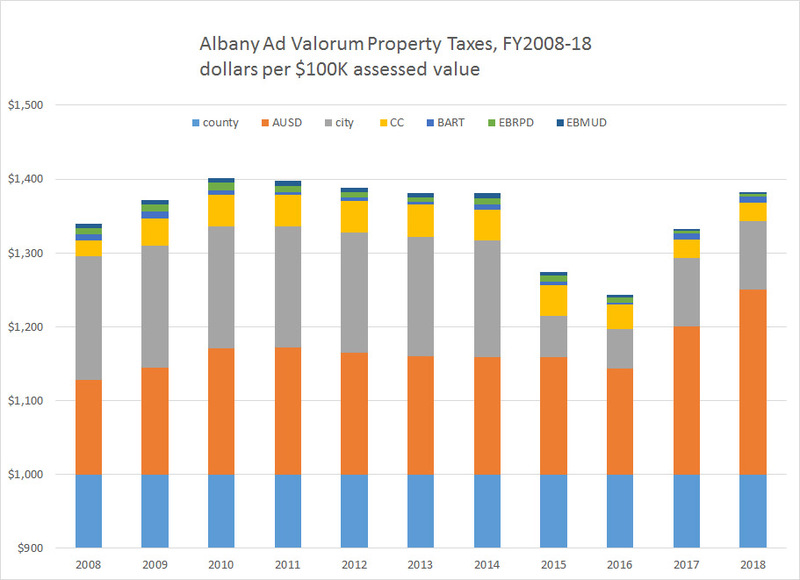 When the tax rates above are applied to today’s assessed values, it turns out our ad valorem taxes will be at a historical high next year. See the chart below for more (click to enlarge). In the chart above, AUSD taxes are in blue, city taxes in orange. The chart above leaves out two taxes, the county ad valorem tax and the parcel taxes. 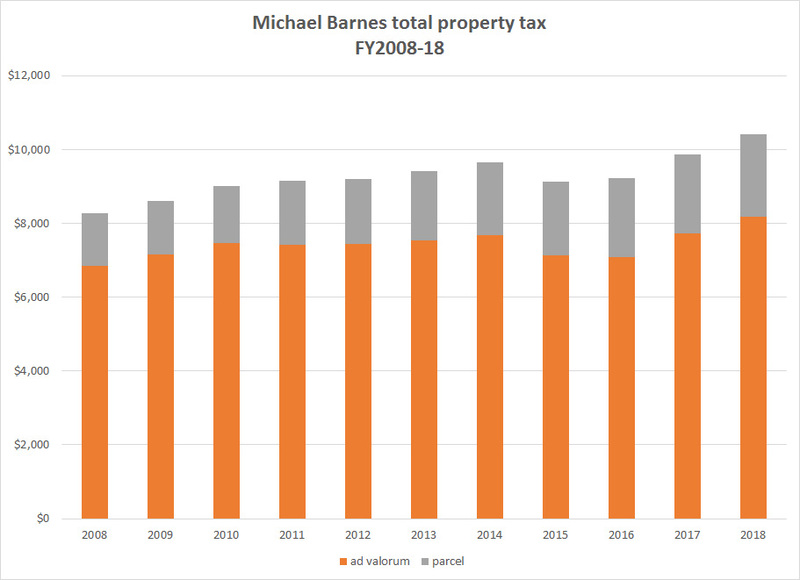 Changes in parcel taxes added less than $20 between 2016 and 2017, while changes in the county ad valorem taxes added about $15 per $100K of assessed value. My total property tax bill rose $646.05 dollars between FY2015-16 and this year, FY2016-17. 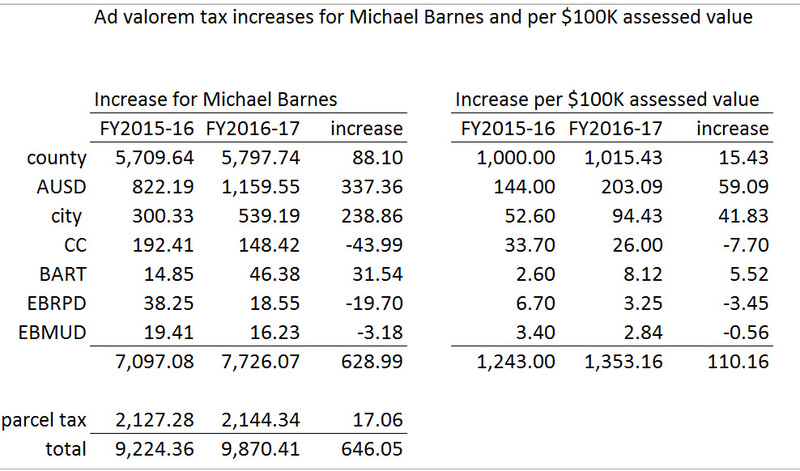 The table below breaks out the details for my tax bill and for $100K of assessed value in FY2015-16. Of my property tax increase of $646.05, all but $17.06 was due to ad valorem tax increases. Of the ad valorem increases, 100 percent of it breaks down like this: 54 percent was due to AUSD, 52 percent was due to the county and city combined, and the remainder taken together declined about six percent. We can expect similar increases next year. The AUSD ad valorem tax rate will rise another $50 per $100K assessed value. We will probably see more CalPERS-related increases from the city. The passage of the county’s Measure A-1 will add a little, as will BART’s Measure RR and the city’s new parcel tax for sidewalk repair. That’s why I’m expecting my property tax bill to be above $10K next fiscal year.